I am writing mini-reviews for the rest... I just think it would be easier as this is the final day and I have to be to work before too long. A nice story... and done well. Though not the type I would watch very often. So not sure if I would actually add it to my collection. But it is worth the time put in to watch it. This one I enjoyed quite a bit and wouldn't mind adding to my collection if I found it cheap enough. A nice story...well made and entertaining through-out. Recommended. Yes.. this one is cheese and very silly at times but I guess I can consider this one a guilty pleasure as I really did enjoy every minute of it. I found myself literally laughing out loud on more then one occasion. I definitely found it worth the time put in to watch it. Recommended. Found this to be a fun film...enjoyed it quite a bit. I wouldn't mind adding it to my collection before too long. Recommended. This is one I have not seen since I was a little kid. And I am so glad I decided to watch it again. I forgot how much I enjoyed it as a kid and it holds up quite well. I will definitely be adding this one to my collection at some point. An average film with a decent story. I just wish the dvd was in a better quality. There was problems with both the audio and video. Well that's it. I so wanted to make it to #60 but there just wasn't enough time before work. But hey... I think I did pretty damn good. Especially considering the genre we are talking about. My number would never of gotten even nearly this high if it wasn't turned into a competition and I wasn't so stubborn. The only problem... Danae Cassandra is just as stubborn and I am going to work knowing that she can still win. To be honest... with this being my least favorite genre I am so hoping I do win. That would really feel like an accomplishment. And it does bug me a little that I have to work all night so I can do no more to fight for it at this point so only time will tell now. Jimi Hendrix and Otis Redding arrived in California virtually unknown. Returning stateside from London, where he had moved to launch his musical career, Hendrix exploded at Monterey, flooring an unsuspecting audience with his maniacal six-string pyrotechnics. Redding, venerable star of Memphis' Stax record label, seduced the "love crowd" in one of his best - and last - performances. Jimi Plays Monterey and Shake! Otis at Monterey feature the entire Monterey sets of these legendary musicians, performances that have entered rock-and-roll mythology. Jimi: Wonderful hour long show from Jimi Hendrix. He changed the way music sounded, and nobody has ever played like Hendrix. It's easy to see why this performance catapulted him forward into the spotlight. He was fabulous. Highly recommended. 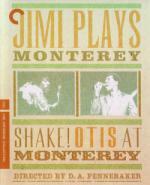 Otis: Great set of pieces from Otis Redding at Monterey. He had such energy and chemistry that it flows through the screen. Short but fine watch if you like him and his music. 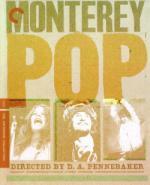 On a beautiful June weekend in 1967, at the height of the Summer of Love, the first and only Monterey International Pop Festival roared forward, capturing a decade's spirit and ushering in a new era of rock and roll. Monterey would launch the careers of Jimi Hendrix, Janis Joplin, and Otis Redding, but they were just a few among a wildly diverse cast that included Simon and Garfunkel, the Mamas and the Papas, the Who, the Byrds, Hugh Masekala, and the extraordinary Ravi Shankar. With his characteristic verite style, D.A. Pennebaker captured it all, immortalizng moments that have become legend: Pete Townshend destroying his guitar, Hendrix burning his. The Criterion Collection is proud to present this timeless document of a landmark event. Interesting documentation of the Monterey Pop Festival but it feels incomplete. As a concert film, the music is excellent but it cuts between acts. I'm pretty sure it's to create a portrait of the entire festival, as if the viewer is travelling from one act to the next, but it means you never get a full set from anyone. There are also moments during Otis Redding's song that the camera is facing directly into the light and the screen becomes a blinding white square. Really annoying. As a documentary it includes little information about the Festival and it's place in the Summer of Love. So there's a lack of context for the less informed viewer. But for those of us who would never have been able to go, the film offers a trip to the Festival, a capsule of a time and place in history. It is wonderful to have it, even if it leaves you wanting more. No film in history has captured the world's imagination like Walt Disney's first full-length animated masterpiece. Through astonishing Blu-ray™ high definition technology, experience this timeless classic in its most spectacular presentation ever! With an all-new, state-of-the-art digital restoration and Disney Enhanced High Definition sound, the breathtaking animation and unforgettable music of the most revered Disney film of all time will enthrall you like never before! Join the beautiful princess Snow White as she escapes her jealous stepmother, the queen, and befriends a lovable group of dwarfs. But when she falls under the queen's wicked spell, only true love's kiss can save her. Except in music, Snow White has it all over Cinderella. Snow White is naive, but she actively tries to help herself and improve her life. Yes, she makes terrible decisions but at least she tries something. The only thing Cinderella has is much better songs. Of course, this is also a groundbreaking film and classic piece of animation, so recommended for everyone for at least one viewing. Pick your favorite spot to watch—anytime and anywhere—and get ready for a fun-filled adventure with 101 Dalmatians for the first time ever on Blu-ray and Digital HD! A lot of people don't seem to like the choice to use xerography in this film, but I like the scratchy look to the art. 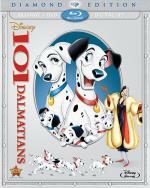 It gives Dalmatians a more unique look compared to earlier Disney films. No complaints about story either - this is a fun film that moves along quickly and easily. Recommended for just about anyone, but be prepared to say "no" when your kids beg for a dalmatian puppy. They're a high maintenance dog that requires an experienced hand. To commemorate its 40th anniversary, Disney proudly presents the unforgettable animated classic Robin Hood on Blu-ray for the first time ever. Experience all the fun, thrills and celebrated music of this legendary adventure with perfect picture and sound! Join Robin Hood, his trusted companion Little John and his hilarious band of Merry Men as they outfox greedy Prince John to save the good people of Nottingham. Dashing from one daring deed to the next, Robin won't rest until he wins the hand of Maid Marian and restores King Richard to the throne. 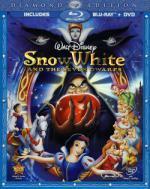 One of Disney's most beloved movies is even better on Blu-ray Combo Pack! You know, it's been so many years since I've seen this film that it was a lot better than I remembered. I remembered it being rather silly, and there is a frivolity about it, but it isn't as childish as I had remembered. I surprised by how much fun this was to watch. Also, Klucky is fabulous. Recommended if you enjoy the story of Robin Hood or Disney films of this era.